Anna: Dad, what’s that one story about a lady who talks to a king in the scriptures? Not Esther. But another lady? Anna: Uh, I don’t know. What happens in that story. Anna: What does it mean to smother a baby?! Me: So… it just means that the mommy accidentally pressed up against the baby in a way that made the baby not breathe, so the baby died. Me: It was an accident. Anna: …and why did the lady talk to Solomon? Me: Oh, um. So, the lady whose baby died was very sad. And she stole the other lady’s baby. So the other lady had them all go to King Solomon because he was very wise and he would help them solve the problem. He would figure whose baby it really was. Anna: What did Solomon do? Anna: What? What did he do? Me: …he told the ladies that he would cut the baby in half. Viva: I really, really don’t like that story, Daddy. Me: But he figured out which one was the real mother. So it ended up being okay. Anna: Except for the lady that made her baby die in the night. Moral: The Bible has some messed up stories that you forget are messed up until you tell them to children, and then the horrified look on their faces reminds you. No more Bible stories, Daddy… PLEASE! Wow. My abs just got a really good workout from laughing soo hard. Thanks for sharing this priceless gem with us! Josh, I want to apologize for some of my earlier comments on your post about that conference connected with Evergreen. I'm not making excuses, but I do want you to know that the things I said/links to youtube I posted, came from a place of frustration. Frustration because I DO have so much respect for you and Lolly (as you know from the other times I've commented on other posts), and found myself annoyed that these two people I looked up to so much were doing something I didn't agree with. My thoughts went something like this "UGH I NEED TO SAVE JOSH AND LOLLY AND GET THEM OUT OF THAT THING CALLED MORMONISM". I now realize that that was as bad as every religious nut-job that feels it is their duty to convert or "save" people. I apologize, it was mean, and especially disrespectful of me to post the links to the temple worship that I already knew were sacred to you. It is not for me to understand, but to respect. And YES, Bible stories can be gruesome. I was 8 when my dad told me the story of the baby and the king's method of determining the mother. I still remember being horrified. You have just posted my all time favorite comment. Its amazing to feel the genuine love and respect you just conveyed through a text script. Thank you, we all can learn from allowing others to define themselves. As we define ourselves throughout our constant learning. Individuality is precious. you now have my respect. Awesome growth on your part. Just wondering whether Josh has seen this/not seen it/seen it and chosen to ignore it. 🙁 Gosh. I'm so sorry! Ahalya–I did see this! And I was very touched by it. I've been so incredibly bad at emails and comments and stuff, but I've been meaning to respond for days. Thank you so much for reaching out in this way, and your apology is 100% accepted–I can see that your comments were coming from a place of concern and affection for me and my family, and I really appreciate that. I think your realization was very mature, and they type of self-reflection that we all (including me, of course) might have from time to time as we interact with others in an honest dialogue. So thanks for the great comment! You don't know how much it means to me to have you accept my apologies. When I first heard of your story, I literally went around talking to my family/friends/people who I probably was annoying (:P) about it, asking them what they thought, having really interesting and productive conversations. Over time my respect just grew for you and Lolly and I found myself checking your blog for new posts daily. I love you guys and what you stand for, and especially that you are so accepting of everyone else's choices. Thank you. For being you. I remember as a teenager when I actually read the Bible, and realized that most of those Bible stories I knew were just the nice parts, and in between were these horribly disturbing stories. Discussions in seminary were always more interesting when everyone was reading and we were all ready to add to the … um … discussion about it. 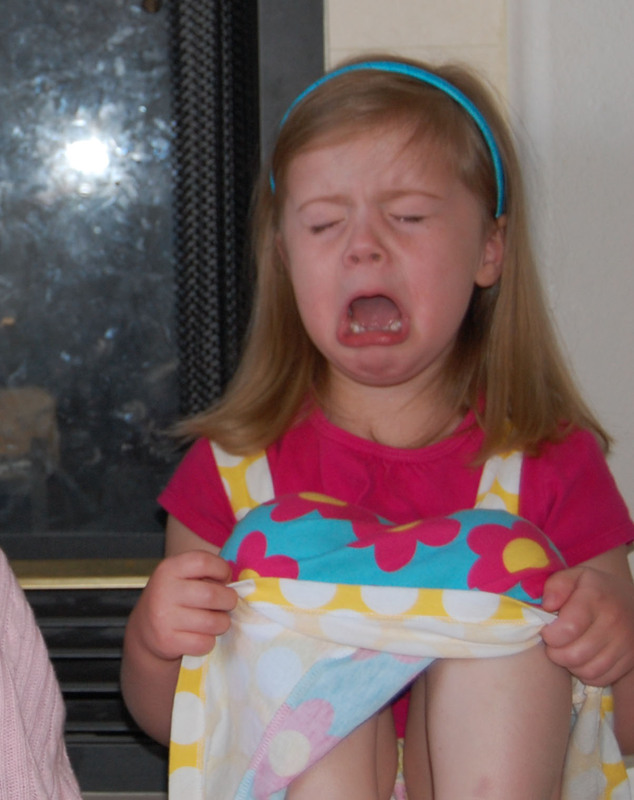 I love pictures of crying of children (probably because I am a monster). What I'm saying is: that may be my favorite picture of Viva of all time. Loved this post! Did you ever find out which story they were originally curious about? Don't you just love getting innocently sucked into ridiculously inappropriate conversations with your kids!? Lol. Happens here a lot. Yes, your great grandmother wears diapers like your little sister…..no, it is not a big deal…..
Oh Tammy you never cease to crack me up. Of course, I had to check out your link to Bambi Nuggets and giggled until I cried. Sooo cute and funny 🙂 – Reminds me of my Dad who, when we were watching childrens' movies or reading fairy tale stories, he would usually say, in a "pretend" scared and horrified voice, "No more, no more – I can't take it – this is toooo scary for ME." As I got older and I observed him do this with his grandkids, I realized that in his special way he was giving the children an "out" to admit they were scared as well, and they always knew that if big strong Grandpa is scared and admits it, it's ok for me to as well. Just wait until they read Genesis 19. I'm not very familiar with Bible stories. But should the case ever arise that I need to learn them, I'd like it if you were the one to recount the wondrous tales. Being an atheist, I've done a really bad job teaching my kids Bible stories as of late. Mom, have you ever given anybody an example? Her: Like if they way wine is healthy? Do you tell them it's not? Me: Some studies say a glass of wine a day is healthy. It's okay to have a little bit. Who says wine isn't healthy? If I do start getting better at teaching my kids bible stories, I think this one is going to be next. Mwa ha ha ha ha! Sleep well, kiddies. Nothing written in the Bible can compare with the bloody detailed grusomeness of how the story of Joseph Smith's leg bone operation is told to CHILDREN. Back about 10 years ago, I was teaching CTRs (this was around the time I was attending church but not enthusiastically and also around the time that I was told in a manual to "explain to the children that Jesus served to his disciples a drink made from grapes") and in sharing time one day one of the leaders got up and started to tell the story of Joseph's leg operation. I suffer from frequent and unexpected vasovagal response episodes and I knew what was coming so I just got up and left. I wish I would have had the balls to take the 7 year olds with me. We don't let our kids watch bloody R rated movies but how we love to tell them the story of Joe's leg. And it just gets better every time. ROFL…. You've got the best girls!! I have this expression in my head of little kid indignation / chastisement/ offended sensibilities… "Well except for the lady who made her baby die!" that is just cracking me up / bringing a lot of nostalgia for those years (Ive got preteen angst in my house). It it's probably inappropriate to be laughing so hard. I'll stop. I promise. Eventually. Its just nice to be on the outside looking in. Note to self: Call and apologize to my mum for giving her the 'death glare' when she burst out laughing ( when I was frantically back peddling with my son after inspiring the same affronted dignity). I should add, the nostalgia is coupled with the sheer relief that Someone Else also photographs their kids before comforting them (from time to time). I distinctly remember daughters being "given to the crowd" explained as a comedy act & tap dancing show. Drumroll please!! We now give you, the one, the only, tap dancing joke telling sisters!!! This might have actually been quite clever of my parents, if it hadn't them caused my sister and I to go volunteering to be thrown to angry mobs (that I danced, and my sister told jokes, was pretty relevant in their 'how they amused the mob' reasoning my parents gave). This caused my parents quite a lot of grief. Lucy! You got some 'splaining to do! Yeah. I wouldn't recommend the whole daughters to the angry mob story for some time. This reminds me of the time that I dressed as Juliet for Halloween and my nephews wanted to know who she was and before I knew it I was explaining the story of Romeo and Juliet and . . . well, I'm just very lucky my sister-in-law has forgiven me. I think. It's worse when they're not your own children, I think. Haha. There actually is a Living Scriptures video about it. We started watching it without really realizing which LS DVD they put in. It was mildly entertaining. We talked with them a bit afterwards. Just in case you want to find that and watch it. I loved that video (Solomon) when I was a child. But of course they made you hate the baby-smothering woman and love the real mother. Hmm…thinking on it, that's not very kind. This reminds me of the first time I read all the book of genesis and found out what happened to Lot after his wife turned into a pillar of salt (quick refresher: he get plastered and his crazy daughters sleep with him to keep the family line going). My jaw dropped and I was like "Are you SERIOUS?!? What the crap!" I was wondering how I'd missed that detail for so many years. I kept flipping the page, assuming I read wrong….but nope. What about the story of the dad who goes off to war and in a moment of desperation pledges to sacrifice the first person who greets him upon his return if they win. Well, naturally, it is his daughter. so, the daughter accepts her fate and only asks to spend like 10 days in the mountains with her best friends to prepare herself. What does this teach? Please tell me if you know! Couldn't the father just admit he was wrong? I saw this post and immediately thought of your daughter, Josh. Twins separated at birth, perhaps? I love it thank you for sharing. Oh, to be a fly on any wall in your house for a day! So entertaining!! Your family is the best!